EXTENDED until January 7, 2019! Give yourself and your loved ones the gift of financial peace this Christmas! Due to a lot of requests, I will be having a special Christmas book bundle promo sale! 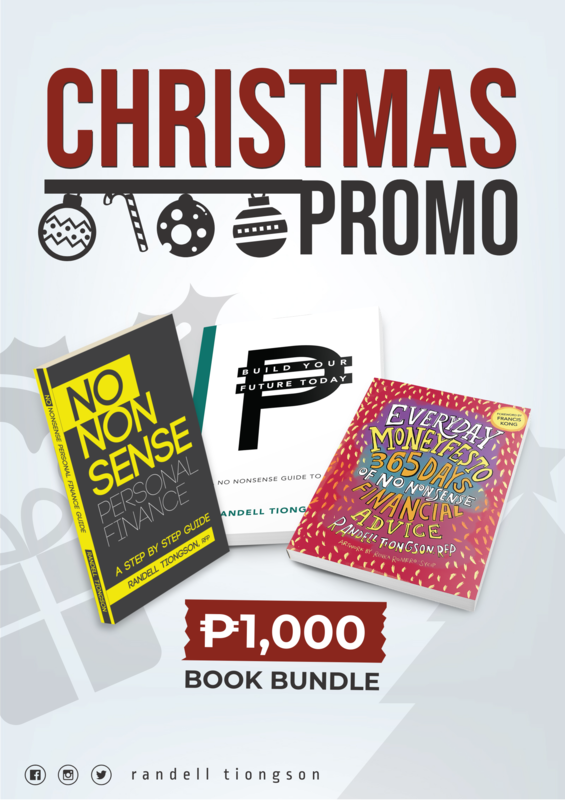 Instead of paying P1,300.00 for No Nonsense Personal Finance (P500.00), Everyday Moneyfesto (P300.00) and Build Your Future Today (P500.00), you can get all 3 books for only P1,000.00 for a limited period of time! Get it delivered directly to your address for FREE if you are using a Metro Manila address and only an additional of P120.00 for provincial addresses. My books are fundamentally sound and yet very practical and easy to read to help you get on the road to financial freedom. They are also meaningful Christmas gifts. Hurry! Promo ends on Tuesday, December 18, 2019. Take a photo of deposit slip or screen shot of transfer advise to [email protected] along with your requested orders, full name, complete address and contact numbers. Good day. May i know how many days will be delivered in quezon city from date of payment? Im from Imus Cavite. Would I be charged with additional 120pesos? Hi, I’m interested to buy those great books of yours Randell. Can I transfer the payment to your BPI account using GCash? Thank you. Do ypu do shippinghere at cebu or in cavite? and how much is the shipping fee? Hi Randell i would like to order 5 bundles of your book. Hello Sir, I’m OFW from Kuwait and i wanted to order your bundle books promo. Please send it to my province in Bataan so once i got vacation from work i can get it. I would like to order 1 bundle. Thanks.